The heart of our aluminum pannier luggage systems is our SU (Structurally Unique) Rack. In the oilhead GS series it comes in either a high-pipe or low-pipe version. 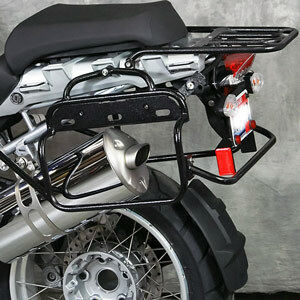 The high-pipe version includes a left-side pannier sculpted to fit around the exhaust. New for this year is our new point1 pressed insert design. It adds to the functionality and security of our pannier to rack fitment. Unmatched strength. No one makes a stronger rack and no one offers a better warranty. Our racks are built to take it ... anywhere ... anytime ... in any conditions. True adventure touring racks. When your trip depends on it accept no substitute. Happy Trails warrants our products for life ... if it breaks and the bike wasn't crashed we'll fix or replace it at our cost. Our panniers are guaranteed leak and dust-proof in all conditions. All Happy Trails products are crafted in Idaho. Imagine riding with racks that protect you and your bike from damage, with dust and waterproof panniers that look great, pack right and add to the safety of your ride. 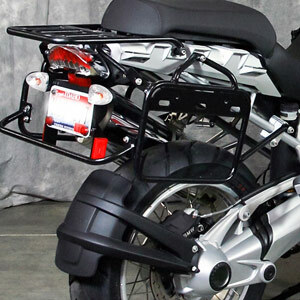 I'm Tim Bernard, founder of Happy Trails Products, home of innovative aluminum panniers and rack systems that have revolutionized the motorcycle luggage industry since 1997. Before Happy Trails, I built racks for myself and friends because there was nothing on the market that satisfied our need. Since opening Happy Trails I've never lost sight of my original purpose: to manufacture the finest custom engineered luggage systems to enhance the use, safety and enjoyment of your Dual Sport & Adventure Touring needs. We now manufacture many other fine products, and have expanded our website to offer quality items from other top manufacturers. Our products are designed and built in Boise, Idaho by riders for riders, and tested by friends worldwide.